For a bird-feeder that is tailor-made for the feeding habits of certain finches, the Perky Pet Upside Down tube feeder has no rival. 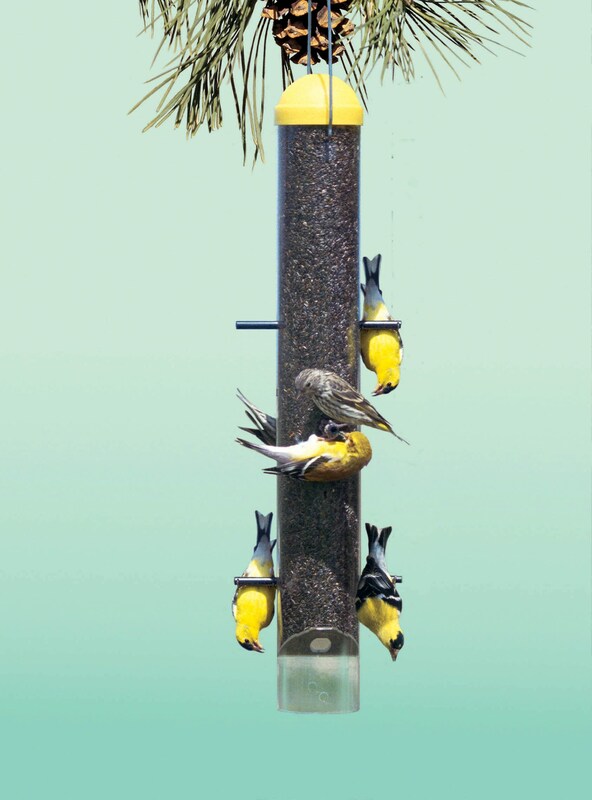 With a unique design that features six different feeding stations, this tube feeder allows birds that feed upside down access, while baffling other speciesperfect for goldfinches and very entertaining for humans! In addition, the Wild Finch tube feeder has a ventilated base to minimize seed rot from rain and snow. A best selling item! Very happy with the "wild finch tube feeder; the finch are also happy. The feeder is well made and easy to assemble. My last feeder (a like item) lasted for over five years. The Finches are back and every one is enjoying them. The product is exactly as described and the best review is the flock of golden finches that come and dine at the feeder, they have endorsed the product by their regular attendance. We love the finch feeders we ordered from you. We love to see them hang upside down to eat from them. Your feeders fold up great for them and are easy to fill and maintain. Will order more from you when needed. You delivered in great time and no hassel! Very pleased with the ease of use and quality of product. Now we have GOLDFINCHES in our backyard!!! It is exactly what we wanted and the birds love it! The Pine Siskins and goldfinches love it. It took them a bit to figure it out but they are quite at home eating upside down. The product was delivered as promised and in working order. We love our upside down bird feeder. It is made and looks great! It's fun to watch up to 6 goldfinches feeding upside down while others perch to wait their turn in a nearby tree. The feeder holds a lot of seed which keeps the finches busy, eating throughout the day. If a large bird comes along he'll scare off the little finches, but only for awhile. After trying to eat standing up and getting nowhere, large birds leave and the little finches all come back. This is an excellent feeder and the gold finches have no problems feeding from it. This worked very well. Because it is an upside feeder the sparrows that normally bully all the other birds mostly leave it alone. It's also easy to maintain. Unfortunately I need to buy a new one because the plastic perches have been breaking off. I have not seen it happen, but I assume it is happening when there is wind and the feeder swings around. In any case, the finches are being progressively squeezed to fewer and fewer perches. I purchase this feeder as a replacement for my old one. I probably wonât get to use it until the snow melt next spring, but when I compare it with my existing one, it seems to be of better quality. I have ordered a total of 5 of these so I must like them pretty well. I have had one of this type for years and am now unable to find them in stores in our area. I keep ordering to give to family members who love watching our gold finches. I do, however, prefer that the top and hanger be in one piece rather than the top being separate from the hanger. The goldfinches are NOT the only ones who can do this. I have other finch feeders, and wanted only goldfinch on this one, so I shortened the pegs they feed from. This helped somewhat, but still other finches can feed there too. Oh well. It's still fun to watch them all feed upside down, especially those beautiful goldfinches. I bought this feeder for my aunt. I also have one and it is so much fun watching the goldfinches turn upside down to eat. It is also fun to watch the house finches trying to figure out how to eat from this feeder. It brings a lot of enjoyment and comedy to my yard. We have other feeders out also but this one is special for the little yellow bellied finches which can hang on and eat upside down. What a delight to look out and see six to eight feeding at one time with no interference from the larger finches we have in our yard. It is fun to watch the golden finches eliminate the other finches from using the feeders. I only wish the feeders had a tray to catch the seeds.I use pizza pans to catch the seeds. I love the upside down wild finch feeders (I got two). It's great to watch the gold finches hang upside down to eat and they're the only ones who know how! The chirper works fine, but I have much less birds feeding now. Need to get another feeder where birds feed not upside down. We only feed the small birds that visit our yard. The yellow finch feeder is especially made for yellow finches. They feed at the regular finch feeder as well as the upside down feeder. I personally don't think that they feed as long at the upside down feeder. Plus the holes seem to be smaller. Do you think they should be enlarged? The Goldfinches love this feeder! The Plastic top is less secure than other feeders of this time. I had a sock feeder before and the finches loved it but I didn't like the way it looked. I put this up and BOOM no birds and after a month they still won't use it. Tthis thing is cheap but still a waste of the money. A complete waste of money. Finches will not use it. I have taken it down and thrown it away!